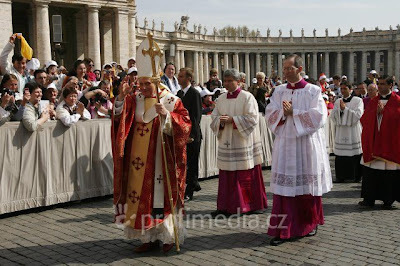 Zenit news has an English translation of the homily given by Pope Benedict at the Mass today for the third anniversary of the death of Pope John Paul II. It never fails to impress me that when Pope Benedict speaks about his predecessor, he does so from a genuine admiration and affection. Having worked so closely with Pope John Paul for so long, I think that he is in a better position than most people to appreciate the dedication, motivation and profound spiritual life of Pope John Paul.